For surviving in battle field, the Mi-8s are equiped with crew cabin armour plating, explosive resistant foam filling in the fuel tanks, a fire-fighting system and duplicated and stand-by hydraulic and power systems and main control circuits. And de-icing systems are added. The Mi-8's landing-transport equipment can be used to load light towed combat material and armament via winches. It can also rescue people from the ground or from the sea by an electrically operated hoist with 200 kg capacity. On the cabin floor there are cargo tiedown points. Ramps are provided for loading vehicles in the big back door. The cabin can accommodate 12 stretchers. And the external cargo sling is rated to carry 3,000 kg. The Mi-8T helicopter is powered by two Klimov TV2-117 turboshafts engines. Deflectors are installed on the engine air intakes to prevent ingestion of dust so that Mi-8 is suitable for unprepared pads. And an auxiliary power unit (APU) is designed for self-contained operations. The Mi-8 can carry 1,870 litres of fuel in two flexible internal tanks and two external tanks. Adding two ferry tanks in the cabin, the total fuel capacity can be increased to 3,700 litres. But the space for cargo is limited in this way. The MI-8TV armed variant is designated from Mi-8T, fitted with 7.62mm built-in machine guns and six external weapons racks with S-5 rockets. The helicopter can also deploy AT-2 Swatter 9M-17P Skorpion anti-tank missiles. The helicopter's weapon sighting system is the PKV collimating sight. Mi-8TV can also be used to make minefields. The Mi-8TV helicopters are fitted with more powerful TV3-117VMA engines which gives an improved hovering ceiling (3,950 m compared to the 1,760 m of the Mi-8MT). The maximum slung payload of the armed helicopter is increased to 4,000 kg. A Hot Brick infrared jammer can be fitted and six ASO-2V flare dispensers are installed, three to the port and three to the starboard side of the fuselage. The Mi-8MPS search and rescue helicopter was developed from the military transport variation. In rescue missions, the helicopter crew drop radio-beacons to mark the distress area and deliver rescue teams to aid and recover the casualties. The helicopter can lift ten people at a time on a sling via a PSN-10 life raft and is provided with an emergency landing device that ensures buoyancy for up to 30 minutes. Mi-8AMTSh is an army, modernized, transport and assoult chopper. It is euiped with automatic cannon, aerial rockets, 8 anti-tank missiles "Ataka" ("Shturm" complex). The Mi-8MPS incorporates specific modifications, including a larger entrance door, two starboard hatches, a raft container and external additional fuel tanks. Other equipment includes PNKV-8PS pilot/navigation system, YuR-40.1 radar system, TAPAS thermal search and rescue equipment, an airborne jib with LPG-300 winch and scoop. For spacecraft recovery, the Mi-28MPS helicopter delivers operational and technical groups with rescue equipment to the landing zone. Instrument and visual search methods are used to locate spacecraft returning the landing zones. The MPS will recover the cosmonaut and return him to base. Up to 3,000 kg cargo can be transported by sling. Mi-8P(Photo on the left) is a passenger transport helicopter, the oval fuselage windows in the military versions are turned into square. And some parts are painted black to avoid the dust from the engine jets. It can carry 28 travelers at one time. Mi-17, entered service in 1975, is the highly improved Mi-8, with more powerful engines for 'hot and high' conditions. NATO calls it "HIP H". The USSR armed forces called it Mi-8MT. It first showed off in Paris Airshow in 1981, and exported to Cuba in 1983. In fact many Mi-8MT in USSR forces are not brand new but converted from fommer Mi-8s. Such as the Mi-8 eletronic countermine version is developed into Mi-17P. 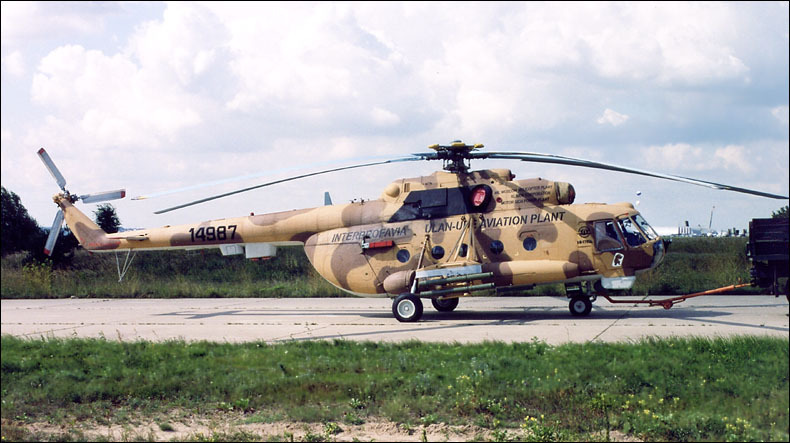 In 1990`s, Kazan Plant began to turned to build the advanced products of Mil, such as Mi-38. The production of Mi-17 was handed to those company in far-east. And Mil upgraded the design of the power plant, eletronic equipments and reliability of the Mi-17. the new Mi-17 is called Mi-171, which begun to be built in 1991. Some Mi-171 is also called Mi-8AMT. 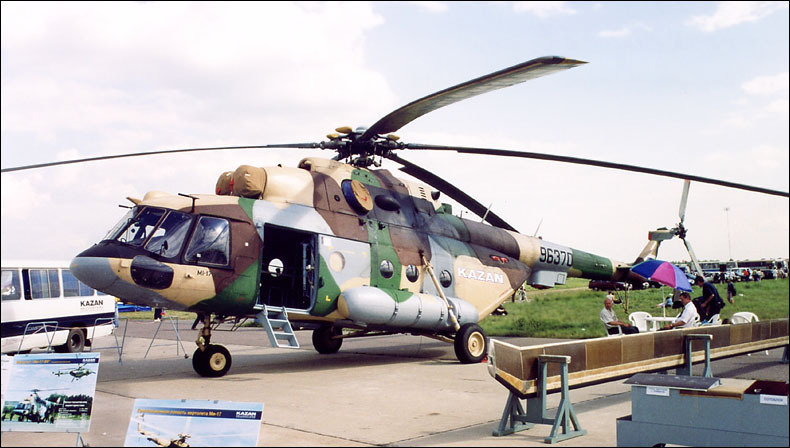 Mar 2002, the Malasiya army imported 10 Mi-171 for US$ 50 million. China imported Mi-8s since 1970`s, Mi-17s and Mi-171s later for military forces and civlian cargo transportation. The following photos presents Mi-17s in China.